Q. I’ve heard it said that Catholics break the First Commandment because we worship saints. I know that’s not true but I don’t know how to explain it. Can you help me? A. This is a good question and something that is very commonly misunderstood. I’d be happy to explain. You’re absolutely right, we don’t worship saints. Worship is something due to God alone. By worshiping God we do a few things. First, we acknowledge that God is God and He alone. The First Commandment states, “I am the Lord your God, you shall have no other gods besides me.” Worship requires we acknowledge that there is only one God. Second, we acknowledge that, as the one God, He is our creator and the only source of our salvation. In other words, if you want to find true happiness and fulfillment and you want to get to Heaven, there is only one way. Jesus, who is God, is the only one who saves us from sin and worship of Him acknowledges this fact. Furthermore, worship is a way of opening our lives up to His saving power. By worshipping God we allow Him into our lives so that He can save us. Third, true worship also helps us to see God’s goodness and helps us to love Him as we ought. So worship is a kind of love we give to God alone. But what about the saints? What is their role and what sort of “relationship” should we have with them? Remember, anyone who has died, and gone to Heaven, is considered a saint. 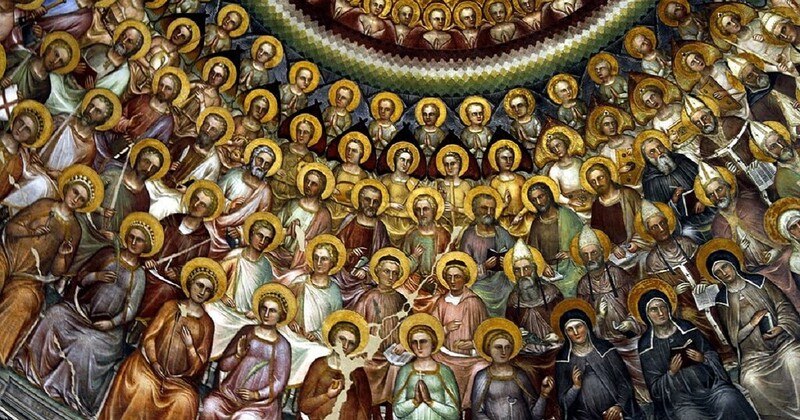 The saints are all those who are now before the throne of God, face to face, in a state of perfect happiness. Some of these men and women, who are in Heaven, are called canonized saints. This means that after much prayer and much study of their lives on earth, the Catholic Church declares that they are, indeed, in Heaven. So that brings us to the question of what our relationship should be with them. Since the saints are in Heaven, seeing God face to face, we, as Catholics, believe that they can play two primary roles in our lives. First, the lives they lived here on earth give us a great example of how to live. So saints are declared saints, by the Catholic Church, in part so that we will be able to study their lives and be inspired to live the same lives of virtue that they did. But we believe they take on a second role also. Since they are in Heaven, seeing God face to face, we believe that the saints can pray for us in a very special way. Just because they are in Heaven doesn’t mean that they stop caring about us here on earth. On the contrary, since they are in Heaven, they care about us even more. Their love for us has now become perfected. Therefore, they want to love us and pray for us even more than when they were on earth. So imagine the power of their prayers! Here is a very holy person, seeing God face to face, asking God to enter our lives and fill us with His grace. It’s kinda like you asking your mom, dad or a good friend to pray for you. Sure, we need to pray for ourselves also, but it certainly doesn’t hurt to get all the prayers we can. So that’s why we call upon the saints to pray for us. Their prayers do help us and God chooses to let their prayers be a reason that He pours even more grace upon us than if we were praying alone. Hope that helps. I suggest you pick a favorite saint and daily ask that saint to pray for you. I’m willing to bet that you will notice a difference in your life if you do.